This adaptation of Mervyn Peake's weird and macabre Gormenghast trilogy, written by playwright John Constable, was exciting, noisy, colourful and, appropriately, mysterious. It's a promenade production with the actors moving round and through the audience between different stages. The venue was moved at the last minute. I don't know what the original one was like but the replacement seemed too small and too low without the space and high stages needed for such an energetic production. Even moving round with the actors it was difficult to see everything. Despite this it was a fine production, visually stimulating and well acted by the young female cast. Some of the acting and costume design seemed influenced by the excellent and under-rated BBC TV Gormenghast series, which is no criticism. Peake's story of a decaying aristocratic family - the Groans - and their downfall at the hands of sinister young upstart Steerpike was portrayed as much by action as words and it would probably be difficult to follow for anyone not familiar with the story. Although there was the occasional lapse into mere recitation the lines were mostly delivered confidently and with passion. I was particularly impressed by Amelia Peterson as the seductive and manipulative Steerpike and Alice Hodgson as the Wild Child, who gibbered and cried furiously, while Camilla Thompsell as Swelter the evil cook was suitably disgusting. The last theatre production we attended begged the questions as to how many interpretations of Shakespeare there can be. An unlimited number it seems but I doubt many are as unusual and original as this Italian production by Teatro Dei Borgia / Compagnia Delle Formiche and Andy Jordan Productions, directed by Giianpiero Borgia and written by Natalia Capria and featuring an Italian/British cast. It's set in a surreal world that slips between Shakespeare's Denmark (the Swedish army is approaching throughout the play) and the world of today(actors wearing iPODs, "Somewhere Over The Rainbow" and different versions of "My Way" ringing round the theatre). The themes of the play are duty, destiny and the nature of theatre. Two of the principal characters are transvestite performers who don't performer (played well by Alessandro Sciusco and Antonello Taurino) but whose image of themselves as on the stage is central to their identity. Rather than avenge his father Hamlet wants to run away from the alcohol fuelled debauchery of Denmark to Paris and become an actor. The tone of the play shifts from comedy to pathos and tragedy and back again, sometimes with confusing speed. The costumes and set are splendid and the acting confident and compelling, drawing the audience into the mad dream world of this fantasy Denmark. Jessica Sedler is excellent as Kate, a servant who is also a voice of sanity, and Charlie Palmer is suitably doubting and uncertain as Hamlet. This was reckoned to be one of the highlights of the Film Festival. Based on a novel by Czech writer Bohumil Hrabel the film is directed by Jiri Menzel and set in the 1930s, 40s and 50s. It's a satirical film that tells the story of Dittie, whose ambition is to own a hotel and become a millionaire, and who works his way up to this position, mostly as a waiter. An innocent in many ways Dittie is happy to accommodate anything that aids his dream, including the Nazi occupation of Czechoslovakia, until the Communist takeover after the war sees him sent to jail. The story is told by Dittie as an older and wiser man, after nearly 15 years in jail, but the key character is him as a young waiter. The film is lavish and opulent, beautifully shot with echoes of Peter Greenaway. The lushness, the graceful choreography, the light-hearted piano music contrasted with the cattle trucks full of prisoners and the war imagery gives the film a moral ambiguity that is disturbing (one of our party hated it, feeling it was a deeply immoral film). Is Dittie a hero? Should the film maker evoke sympathy for someone who joins the Nazis (though without any real understanding of what they are) and doesn't oppose the war? Perhaps Dittie should be contrasted with the head waiter at the hotel he works in when the Nazis take over who is eventually taken away, head held high, as he refuses to salute Hitler and accept the Nazi dominance. That the film raises such questions and challenges the viewer gives it a depth that belies some of the pretty filming and tinkling piano. Martha McBrier: so you think you're a good heckler? Edinburgh was awash with comedy shows (are there that many funny people around?) and I was assured that going to a late night comedy show was an essential part of attending the Festival. On the somewhat flimsy basis that she apparently once knew John Manning of TGO magazine and TGO Challenge fame we went to see Martha McBrier, a Glaswegian comic with a show with a rather provocative title. For some of the audience it was a bit of a challenge though sitting at the back of the cavern like room (with drips falling from the rough brick roof) we mostly missed her attentions. McBrier was everything I expected a late-night stand-up comedian to be - crude, rude and (mildly) shocking. The show wasn't so much about heckling as audience participation with McBrier getting us to vote and comment on her jokes (some good, some appalling). The humour, and much of the show was very funny, lay in her interaction with the audience rather than the jokes themselves and she did find a few people who delighted in sparring with her. The show was light relief after all the rather serious drama we saw but enjoyable and worthwhile for all that. 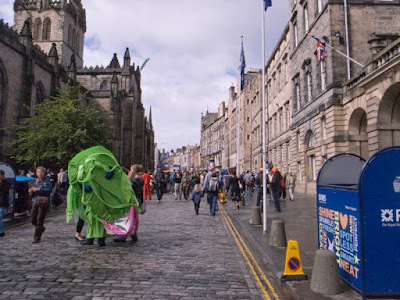 The picture shows a street scene in Edinburgh during the festival. Photo info: Ricoh GR-D, f9 @ 1/640, ISO 400, raw file converted to JPEG in Photoshop Elements 5 and processed in DxO Optics Pro. Arriving in Edinburgh at Waverley Station we made our way through the sudden and startling throng to the Half-Price Hut on Princes Street and bought tickets for a play called Babble that my partner had marked as sounding interesting in her Fringe guide and about which I knew nothing. Within a few hours of arrival we were in a small, dark, almost claustrophobic room listening as a strange, dark, somewhat claustrophobic monologue unfolded. Babble is about a world consisting of an endless library full of books no one can understand, a nightmare world of futile quests for meaning. A disturbed and disturbing Gothic figure welcomes us in and tells us, haltingly and with many asides, about his tragic and seemingly futile life. This sounds potentially depressing and possibly dull but in fact the play is engrossing and thought-provoking and there's an excellent performance by Jonathan Clarkson as the at times sinister, at times pathetic Librarian. The play was written by Eric Conway, based on a short story by Jorge Luis Borges. As an introduction to the Fringe it was a serious and intense work, presaging much of what was to come. A few days later we saw another play that was, in its own way, about meaning and purpose. This tells the story of Scott and Amundsen's race for the South Pole and was adapted from expedition diaries by GM Calhorn. The two protagonists, played by Adrian Lukis (Scott) and Jamie Lee (Amundsen), describe the planning and execution of their journeys, at times directing comments and looks at each other. Lukis and Lee, dressed in appropriate polar costume, even down to old ski boots, are superb, capturing well the different personalities of the two explorers and their feelings of trepidation, exhaustion, excitement, wonder, triumph and despair. The final tragedy is poignantly told. The world of the Antarctic is captured well too and at times I expected to see the audience shivering, as I was inside. An excellent interpretation of one of the epic stories of exploration that made both men more human and sympathetic than they are often portrayed in books. This exhibition at the Scottish National Gallery of Modern Art was the only show I had planned on seeing in advance. Ironically it was the only one I found disappointing. Fascinated by the idea of walks as art works and liking the idea of art that explores relationships with landscape I really wanted to like this exhibition but it just didn't make any significant impression on me. I went round twice, in case I'd missed some vital clue or connection, but to no avail. I saw some nice patterns and some intricate circles and spirals but these had less effect on me than a well-made dry-stone wall let alone a rock face or a tree. The photographs, snapshots in the main, left me unimpressed. Many had words about the walks and the places written on them and some of the art works were just words. None of these conjured up anything. Some just seemed statements of how many days Long had walked and how many miles in a day. I can see that some of the works were fun to do. Throwing muddy water at a pristine gallery wall and letting it drip down to form streaky patterns was probably entertaining. The result left me cold though - to my eyes it looked like what it was, muddy drips on a wall. A map of Britain consisting purely of rivers did stir me a little. If that had filled a wall I might have been impressed. And at the end of this extensive exhibition there was a short poem that touched me. 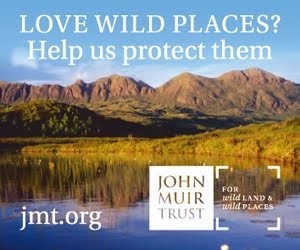 Finally the artist had succeeded in communicating a love of wild places. I'm sure Richard Long enjoys his walks and they are meaningful for him. But if I want to be inspired or made to think about walking and wild places I'd rather look at photographs by people like Colin Baxter, Colin Prior, Ansel Adams and Galen Rowell or read the works of Colin Fletcher or Edward Abbey. Outside the gallery is a lawn leading to sculpted grass terraces reflected in curving pools. This is an art work by Charles Jencks called Landform. I found it soothing and graceful, a modern reminder of the great landscape gardeners of the eighteenth century. The image above shows part of Landform. Photo info: Ricoh GR-D, f9 @ 1/200, ISO 100, raw file converted to a JPEG in Photoshop Elements 5 then processed in DxO Optics Pro. Urban landscapes are not my favourite places but as cities go Edinburgh is one of the most diverse and interesting. And it has the Festival, a summer of art and entertainment. I'd never visited the Festival until this year, always preferring the hills, but invited down by friends and with my partner going I decided to risk a few days of city life. I went open-minded, with no real idea what to expect, and came home replete with artistic satisfaction and delighted with most of the shows I had seen. There are many festivals of course - official, fringe, film, book, art. The Fringe is the big one, with over 2000 shows, of which we saw six - five theatrical, one late night comedy. One art exhibition and one film added brief visits to those festivals. There was an outdoor element - one play was about Scott and Amundsen, the art exhibition about walking. 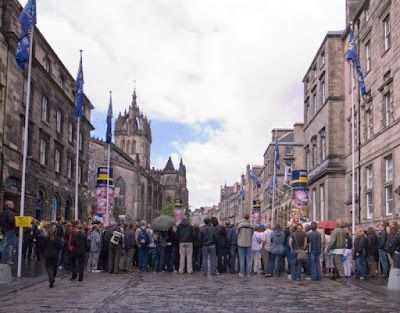 Edinburgh itself becomes part of the event, with crowds wandering its old and twisted streets and gathering to watch street performers. Characters in costume amble out of their venues for sustenance, barely meriting a glance. Posters, often plastered with reviews, scream for attention and show promoters thrust leaflets at you constantly, the most vigorous and determined street sellers I've seen outside Kathmandu. It's all very colourful and exciting but eventually I did find pushing through the hordes and the roar and smell of the traffic wearing and I was glad to seize an hour away from the clamour and climb Arthur's Seat in the rain to look out on a misty Edinburgh fading away into greyness. This little 250 metre rocky volcanic remnant had been my first ever Scottish hill back when I was eleven and here on a school trip. I'd sneaked off with a friend, drawn by what seemed a huge mountain, and we'd found our way to the top, returning to a telling off by worried teachers that washed over me. Nothing could crush the feelings of wonder and triumph. Brought up on the flat Lancashire coast and never having climbed anything higher than a 20 metre sand dune before I was astounded at this little hill. All I remember now is how good it felt to climb it, to be there on a summit, above everything else. Of the shows I saw one had the same stunning effect on me as Arthur's Seat all those years ago. Macbeth: Who Is That Bloodied Man? Biuro Podrozy. Held in the open air in the cobbled Old College Quad this Polish theatre production was an astonishing sensory feast that has left strange images floating in my mind that I suspect I'll never forget. Black robed witches, their faces hidden by white veils, stalked the cobbles on stilts, sinister and powerful. Macbeth and Banquo were gun toting soldiers roaring round on motorbikes. Snatches of Shakespeare floated in the air at times and there was some powerful singing but overall this was a visual show. Fires flared from posts and walls, gun shots rang out, tall poles toppled and fell, representing deaths. Lady Macbeth went to pieces, seen hazily naked as she tries to wash out all that blood. Earlier a naked prisoner in a cage symbolised the victory of Duncan. Macbeth and Banquo, on foot, shoot the witches, now down from their stilts, repeatedly only to find them leaping back to life. Banquo's son tempts Macbeth with a crown rolled along the ground on a stick as a child's toy, a strangely unsettling image. At the finish the tall poles appear again, now as Birnam Forest come to Dunisinane, and Macbeth burns in his blazing castle. Intense and absorbing, this surreal drama drew me in and held me spellbound. I'd love to see it again. The photo shows people watching a street show in the drizzle on the High Street. Photo info: Ricoh GR-D, f9 @ 1/320, ISO 400, raw file converted to JPEG in Photoshop Elements 5 then processed in DxO Optics Pro. Whilst Islay doesn't have the highest or most exciting hills in the Hebrides it does have splendid beaches and magnificent cliffs, making it a good island to visit for those who like coastal walks. Laggan Bay is a five mile stretch of golden sand backed by dunes and machair facing the Atlantic Ocean with complex low broken rocky cliffs at either end. The picture shows a wild wind-driven sea crashing over the rocks at the southern end of the bay. I was balancing on the slippery rocks right at the edge of the surging sea with waves breaking on either side and at my feet, an exhilarating, exciting and noisy place to be. I took many photographs but particularly like this one of the water running back off the rocks after a huge wave had broken over them. In the background can be seen the long golden line of the sands. Researching information on Islay before my visit I managed to miss Armin Grewe's excellent website and blog. 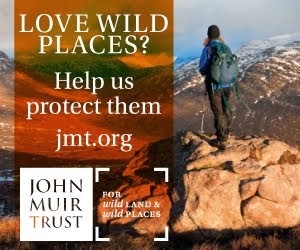 Indeed, if he hadn't commented on my first post on Islay and Jura I still wouldn't have known his site existed. If you're interested in Islay this informative and entertaining site is worth a long look. You can even buy Islay themed T-shirts! Photo info: Canon EOS 350D, Canon 18-55mm lens @ 21mm, f8 @ 1/400, ISO 200, raw file converted to a JPEG and processed in Capture One Pro. In a comment on my last post Armin asked if I was going to post any pictures of the Jura and Islay hills. Here's one, showing two of the three Paps of Jura. Three is a rather unusual number as Paps means breasts. It makes me think of Eccentrica Gallumbits, the Triple-Breasted Whore of Eroticon 6, in Douglas Adams' The Hitchhiker's Guide to the Galaxy books, long favourites of mine. 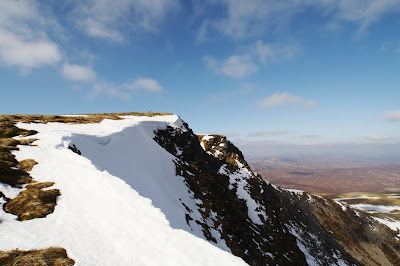 The two in the picture are Beinn an Oir (on the left) and Beinn Shiantaidh, viewed from the slopes of the third, Beinn a'Chaolais, the only one from which I had clear views. Photo info: Canon EOS 350D, 18-55mm lens at 18mm, f8 @ 1/320, ISO 200, JPEG straight from camera, no post processing. 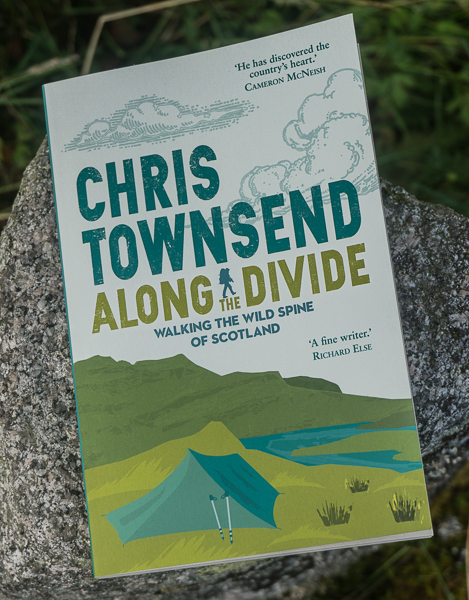 Over the years I have slowly been visiting the islands of the Hebrides and climbing their mountains. Islay and Jura, the southernmost islands, had been on my list for some time but the distance from my home in Strathspey and the attractions of the many fine mountains in between kept me away until last week. The two islands are a great contrast, Islay being mostly low lying with vast peat moors and only a few hills, the highest rising to just 491 metres, while Jura is mountainous with little flat land and three summits - the Paps of Jura - rising to over 700 metres. 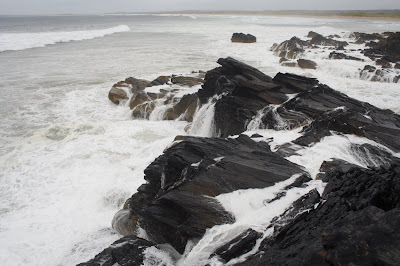 Islay is not an island to visit for the hillwalking but it does have many fine beaches and eight whisky distilleries. The only ferry to Jura goes from Islay anyway so to visit the latter you have to visit the former and the Paps of Jura are superb, steep, rocky hills that every hillwalker will relish. We stayed in Port Ellen, where the ferry from the mainland docks, and visited five of the distilleries, three of which - Ardbeg, Lagavulin and Laphroaig - lay only a few miles from the ferry terminal. Bowmore is a little further and Kilchoman further still. If you haven't heard of the latter - and I hadn't until I reached Islay - it's because it's brand new and it'll be a few years before the first bottles of whisky are available. In the meantime you can taste the basic spirit - which isn't bad actually - and have an enjoyable tour of the first new distillery on Islay for 124 years. In fact all the distilleries have interesting guided tours, of which we thought Ardbeg was the most informative. After the tours there are whisky tastings, with Bowmore the most generous. Of course once you've tasted the whisky it's hard not to buy some and we came home with four bottles of malt, a dram of one of which - the unbelievably gorgeous Laphroaig Cask Strength 10 Year Old - I am sipping as I write this. In between distillery visits I did manage some hill walking, ascending Islay's highest peak, Beinn Bheigier, which gives excellent seascape views, and the three Paps of Jura. The latter are rugged, quartzite hills with some almost-scrambling sections, much scree and places where careful route-finding is needed, especially in mist, which came and went during my walk. Unlike the Islay hills the Paps of Jura feel like real mountains, rising precipitously above beautiful lochans and deep corries. To their north stretch equally rough though lower hills in a remote area that looks well worth a few days exploration with a tent, a good reason to go back. Along with the three distilleries I have still to visit. The photo shows stills in the Laphroaig distillery. Photo info: Canon EOS 350D, 18-55mm lens at 18mm, f3.5 @ 1.60, ISO 200, flash, raw file processed in DxO Optics Pro.